Vintage Modified Stratocaster HSS, STC-Shaped Guitar from Squier in the Stratocaster series. 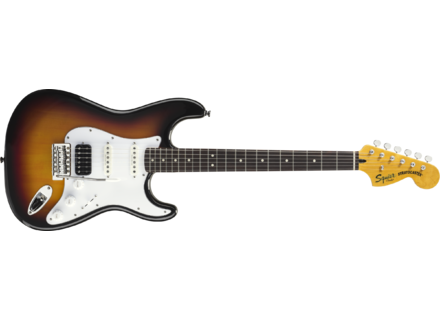 Squier announces the debut of the new Vintage Modified Series. The new Vintage Modified series introduces new model types outfitted in retro-inspired, chop-shop looks. The new series includes five models. New to the series is the Vintage Modified '70s Stratocaster, a model that delivers the look of the 1970s Fender guitars. Available in all-Black maple-fingerboard and Vintage White rosewood-fingerboard, both models feature a large headstock, vintage-tint gloss neck and black plastic parts typical of that era. The new Vintage Modified Telecaster Special puts a spin on the model with tmodded features, including a Jazzmaster neck pickup, and a vintage-tint maple Jazzmaster neck. This guitar is available in White Blonde and Butterscotch Blonde. Also new to the series is the Vintage Modified Surf Stratocaster. Features include tube-style pickups and classically colorful Surf Green, Sonic Blue and Candy Apple Red finishes designed to evoke the sand, sun and fun vibe of Fender's early-'60s golden age. The Vintage Modified Stratocaster HSS comes with new features, including a vintage-tint gloss neck, '70s-style large headstock, humbucking bridge-pickup tone and a new Charcoal Frost Metallic finish option in addition to Black and Three-color Sunburst. The revamped Vintage Modified Stratocaster arrives with new features and its classic triple-single-coil tone. Other features include a vintage-tint gloss neck, '70s-style large headstock, and a new Vintage Blonde finish option along with the Black and Three-color Sunburst finishes. [NAMM] Vigier Excalibur Special 7 Vigier present the Excalibur Special 7.